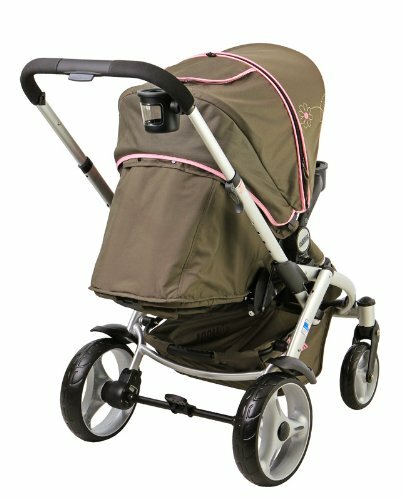 Mia Moda Atmosferra Review - Is This Convertible Stroller Right For You? 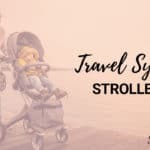 Right now, convertible strollers are extremely popular and it’s understandable: we love the stylish design and most of all we like the seating options. Modern looking AND functional all in one stroller! Unfortunately, most of these beauties are out of our price range, so I was incredibly pleased when I learned about the Mia Moda Atmosferra because not only is it affordable, but the feedback on it so far have been outstanding. I just had to get it to review! I took this full-sized convertible (reversing seat) stroller on a walk around a nearby university campus with my friend who has a 17-month-old to get her opinion. Another friend of mine has a 3-month-old who got to enjoy a ride. In addition, I took the Atmosferra around the neighborhood with 30 pounds in the seat to test out the maneuverability, bumpy sidewalks and overall performance. By the time you finish reading this detailed review of what I put this stroller through, you will discover the features I would change about it and what impressed me. I think you’ll find this quite helpful in making your decision. 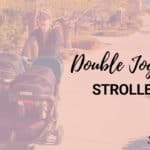 Let’s take a look in detail at what the Atmosferra Convertible Stroller can do for value-conscious parents like yourself, so let’s start with the features. 2 Can a newborn ride? 3 Tell me more about the seat. 6 What is the canopy like? 7 What about the fold? 11 Where can I buy the Mia Moda Atmosferra? This is a fantastic stroller for newborn babies. You get options! Take off the main seat altogether and install the Mia Moda Certo car seat. You’ve now got a stylish and lightweight travel system. The other option is the folding bassinet. Yes, what you do is flip up the adjustable leg support and unfold the fabric tucked away behind it. The fabric hooks over the snack tray and snaps into place at the sides, providing a secure enclosure. Because the seat reclines flat, your young baby has a safe place to lay down. Also, the back of the seat is fully enclosed, providing an additional safety measure. Baby’s feet are supported by the flipped-up leg rest. The next photo shows you how the enclosure looks with the hood all the way down and recline completely flat. When your infant is ready to sleep and needs dark and quiet, the Mia Moda Atmosferra provides safety and security for naps. Tell me more about the seat. There are both good and “could improve” aspects about the seat, so let’s begin with the good. First of all the seat reverses so your child can face the world outside or sit facing you. With a rear-facing seat, mother and daughter have much better communication and bonding. Reversing the seat is easy: pull up on a small lever on either side of the seat and it comes right out. You do have to take careful aim to insert each side properly and I would have liked a “click” to ensure the seat is in place, but with a little shake you can see the seat is secure. Now most convertible strollers have a seat mounted on the frame, just like this one, and that means it’s going to wiggle just a little bit. Don’t worry, it’s still safe, just the nature of the attachment. Some parents have mentioned that this little wobble helps lull their children to sleep. I like the recline on the Mia Moda Atmosferra. It’s a 3-position recline with a one-handed lever on the back of the seat. It adjusts smoothly and easily. You can clearly see on the back of the stroller which position it’s in and set it forward or backward as you need. The upright position seems straight enough. Your child gets a snack tray with a cup holder that has grippers on it so that sippy cups and bottles stay put. With a push of a button on either side, the tray comes off easily for your convenience. As mentioned earlier, the legrest is adjustable, so not only can you flip it up for the newborn bassinet feature, but you can angle it out straight for little legs that need additional support so they won’t dangle. It’s much more comfy for your baby. Now here’s the “could improve” part about the seat. I’d read reviews that it was a small seat and I must confirm that this is true. The seatback is only 16″ high and the seat width is only 10″. When my 17-month-old child rode, the top of his head cleared the seatback by a few inches. His feet touched the bottom of the foot rest. He weighs only about 20 pounds, so he’s only half way to the maximum capacity. Folded w/seat: 45″L x 19½”D x 23¾”WFolded frame: 38½”L x 17″D x 23¾”WWidth: 23¾”Length: 39½”Handle height: 37¼”Seatback: 16″Seatback to canopy: 22½”Seat Width: 10″Tires: 12″ rear, 7½” frontStroller Weight: 23.8 lbs. 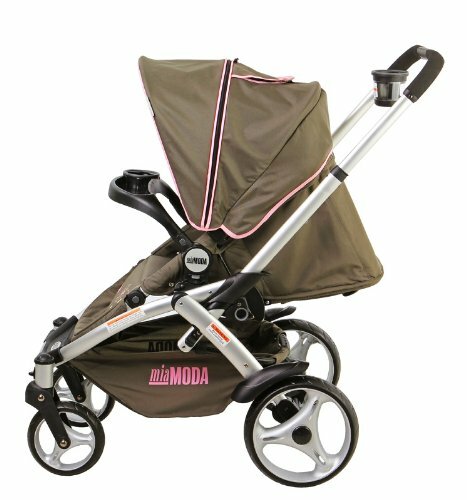 With its all-wheel suspension, the Mia Moda Atmosferra delivers a smooth ride and the swivel wheels are highly maneuverable. I found I could steer one handed even with 30 pounds in the seat, though it wasn’t as easy. Lighter weight, of course, makes steering easier. The front swivel wheels have the option of locking straight which gives greater stability when going over rougher surfaces. The suspension is fantastic and it takes the bumpy sidewalks quite well. Now I have to tell you that I love, love, love the parking break. A pedal is right there in the middle of the rear axle and one step down stops the stroller. A flick up with the foot unlocks it and you’re on your way. Not flip flop friendly, but so easy. What is the canopy like? I’m impressed with the canopy on the Atmosferra stroller. When you need extra coverage, just unzip the middle of the hood and it expands with an extra panel. It can extend almost down to the snack tray, shielding your child from the sun from any angle. It’s a terriffic canopy. The top of the canopy has a nice large peek-a-boo window which is vinyl with mesh embedded. A flap covers the window and is secured with velcro. I would have liked to see a magnetic closure because it’s much quieter and won’t wake baby when you want to check in. To keep the flap up, roll it up and an elastic loop goes around a barrel-shaped button to hold it in place. 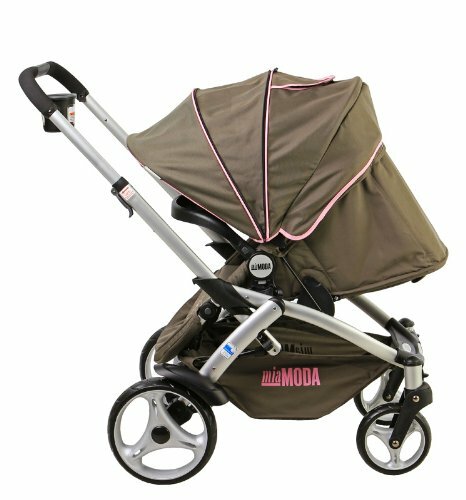 The fold is one of the disadvantages of the Mia Moda Atmosferra convertible stroller. It’s tricky to do, involves several steps and takes some practice to get the hang of it. Locking the wheels before folding helps the whole process. You first have to move the handle bar to the lowest position then pull a ring on the left side of the stroller. That brings it together in a standing fold. I found that getting the handle bar into the lowest position to be kind of hard to do sometimes. Once folded the front wheels touch the basket, so make sure your front wheels are clean enough. An automatic frame lock engages when your stroller is folded together tightly, and that can be tricky to get as well. To unfold the Mia Moda Atmosferra, you have to unlatch the framelock and step down on the storage basket rim. There’s a plastic covering where your foot goes so it won’t wear out. This part’s pretty easy. You can fold this with the seat attached, but it has to be forward facing. It’s also big and bulky once folded, but most full-sized strollers are. I was able to fit this in the trunk of my mid-sized sedan OK, but it took up most the space. The storage basket has ample space underneath the seat, and what I especially like is that you can access your belongings through the front or the back, depending on which position your seat is in. A storage pocket behind the seat is just the right size for your cell phone, keys, camera and other small items. I like the magnetic closure and just wish the peek-a-boo flap had the magnets, as well, to keep it quiet when baby’s sleeping. 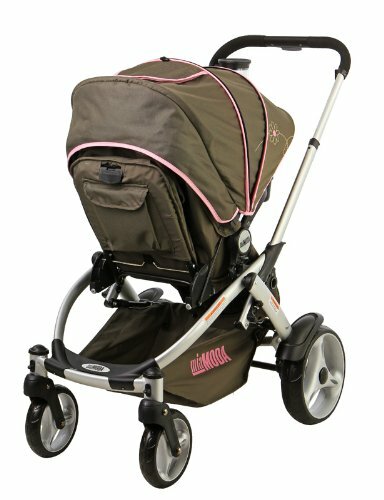 The handlebar is adjustable, so whether you’re not the tallest mom around or you like to let your older kid help push, you can find a height that is comfortable and won’t kick the back as you walk. It telescopes up and down and the shape of the handle is comfortable. 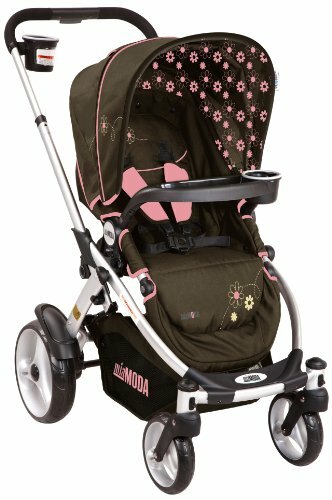 Lots of convertible strollers with adjustable handle bars don’t include a cup holder, but the Mia Moda Atmosferra does. It has the grippers around the rim that holds cups and bottles of many different sizes without spilling. You know what I have to say about this product, but what do other parents think? Reviews give the Atmosferra high marks for the seating options, value for price and superb maneuverability. Many parents say what a great and attractive stroller the Atmosferra is for the price. The two main disadvantages are the difficult, bulky fold and the small seat. 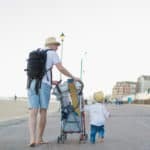 While the stroller is bulky once folded, some parents have said that it is light enough to put into the trunk of an SUV. Personally, I fit it OK into my mid-sized sedan trunk with no problem. Taking off the snack tray helps. The seat is small though and you’ve got to be aware that it may not hold average children over 2 or 2½ years. Where can I buy the Mia Moda Atmosferra? My favorite place to buy strollers and find excellent deals on them is on Amazon because prices are extremely competitive and you get prompt service. In my opinion, you cannot go wrong. 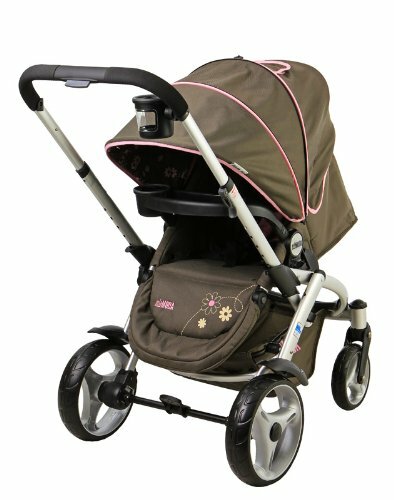 Can you just see yourself right now strolling around with your baby in the classy-looking Atmosferra?